There comes a time in every person’s life when they want to make a difference. Perhaps just one small contribution for the good of the world. For Najat El-Taji El-Khairy that moment came when she applied her forty years of art experience to create a new and exciting artistic medium: Palestinian art painted and preserved on porcelain tiles. This innovative merger of two art forms was Najat’s way to protect and preserve the rich heritage of Palestinian art for generations to come. For it, like so much else, was becoming lost to her people. For Najat, this was the time to reclaim her artistic heritage - from all corners of Palestine including the Levant. As it happens Najat means rescue and survival. Take for example Palestinian embroidery. These rich, highly detailed patterns have been passed on through generations. 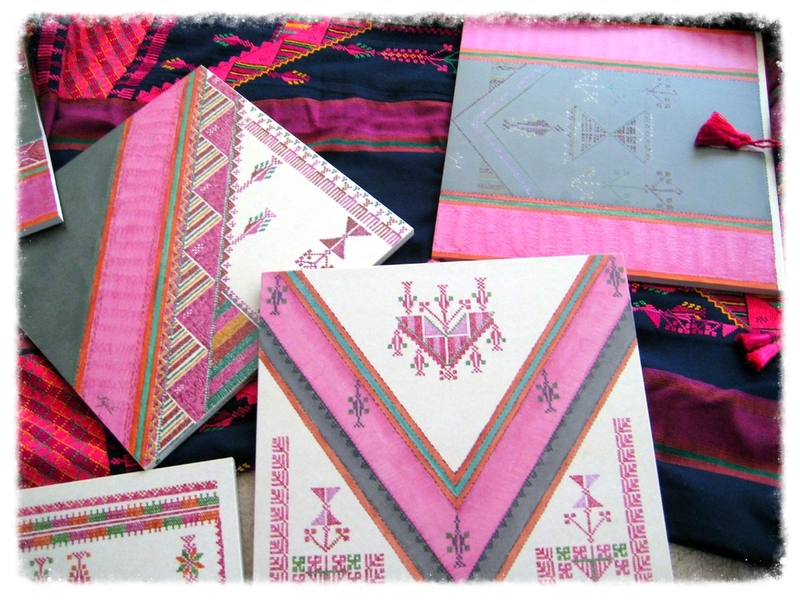 In not so ancient times, young Palestinian girls would learn Palestinian cross-stitching to create a personal trousseau. Garments they made, such as their wedding dress, would last for the rest of their lives. Countless hours would be shared between grandmother, mother and daughter to create the detailed and intricate patterns that told their personal life story. Each was often unique to their region of birth. Since 1948, the resources and united family generations needed for creating these unique regional embroidery patterns have become a deteriorating memory of happier times. From her studio in Montreal, Canada Najat El-Taji El-Khairy is now reaching out to reclaim and document Palestinian art by painting it and preserving it on a lasting porcelain surface. Along with Palestinian embroidery paintings, she also paints Olive trees, Arabic calligraphy, and The Tree of Life images. All highly symbolic of generations of Palestinian culture. She welcomes your inquiries to add an original Najat piece to your art collection. Because this is her passion.